Lake St-Victor is at the origin of the project. It is the largest lake with 8 kms or 6 miles of shoreline. It is deep, clear and indigenous trout is abundant. Each property on the lake has a minimum 300 lin.feet or 100 lin.m. of shore line. The average size of the lots on the lake front is approximately 125,000 sq.ft. or 11,600 sq.m. and over. The backland is all owned by the lake shore residents which completely protects it of any futur development near the all ready existing houses by the lake. The houses being at 100 feet or 30 meters minimum from the lake are built in harmony with the forest thus keeping the natural aspect seen from the lake and also giving beautiful views from the homes. Like all lakes on Lake St-Victor Estates, gas powered motorboats are prohibited and the use of electric motors is permitted. 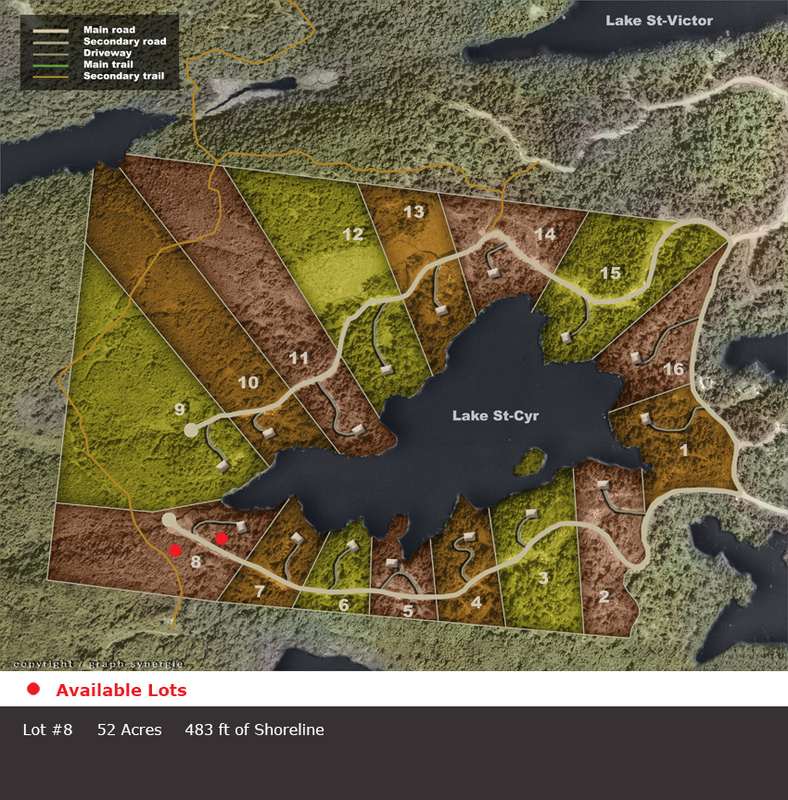 Their are only few lots for sale on the shore line at lake St-Victor. For more details, consult the map. 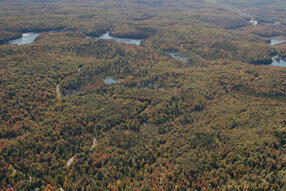 Lake St-Cyr is situated south-west of lake St-Victor from which it is seperated by a narrow wooded zone. It is part of the expansion that was undertaken by Lake St-Victor Estates to preserve the land around lake St-Victor since 2002. It has the same basic criterias as lake St-Victor. It is the second largest lake of the project with appr. 3km. (1.8 mi.) of shoreline. In this lake also, speckled trout is in abundance. 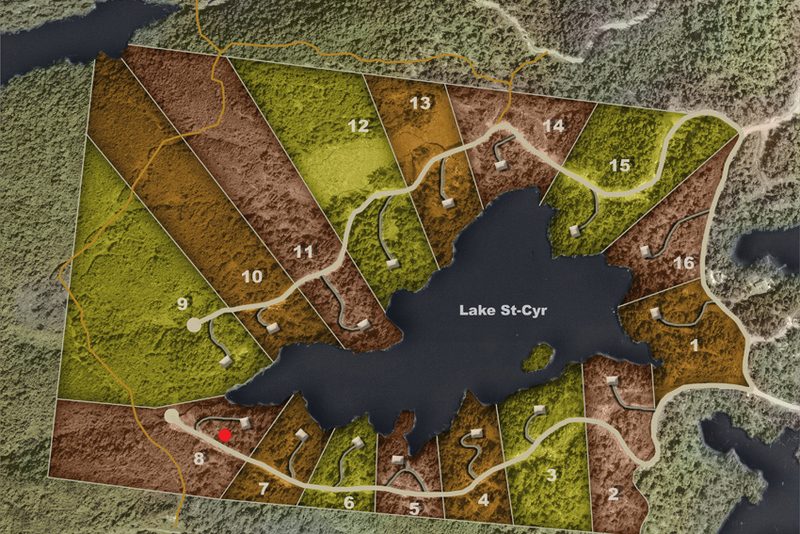 The concept of lake St-Cyr makes it even wilder and quieter since the lots are divided with a minimum of 153 lin.m. (500 lin.feet) of shoreline on the lake. For this reason their is only 16 lots (50 lots were planned originally by its previous owners). 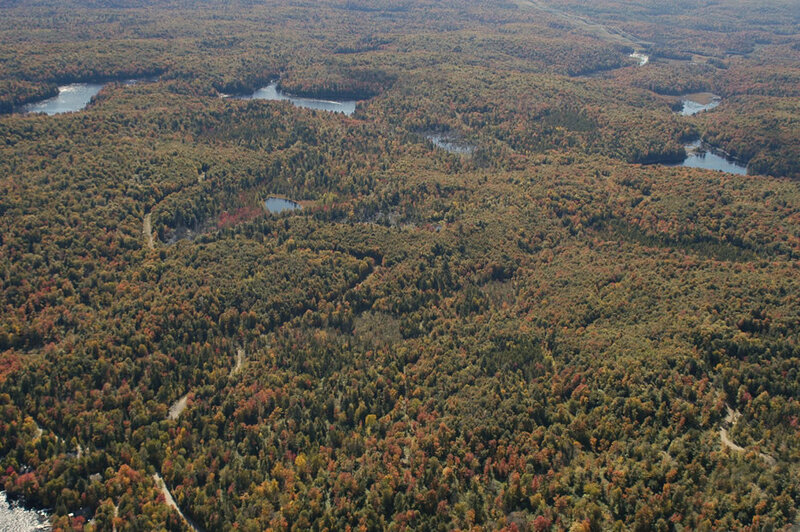 The lots vary from 5 to 20 acres (2 to 8 hectares) in size. These are truly private estates beyond all expectations for nature enthousiasts. 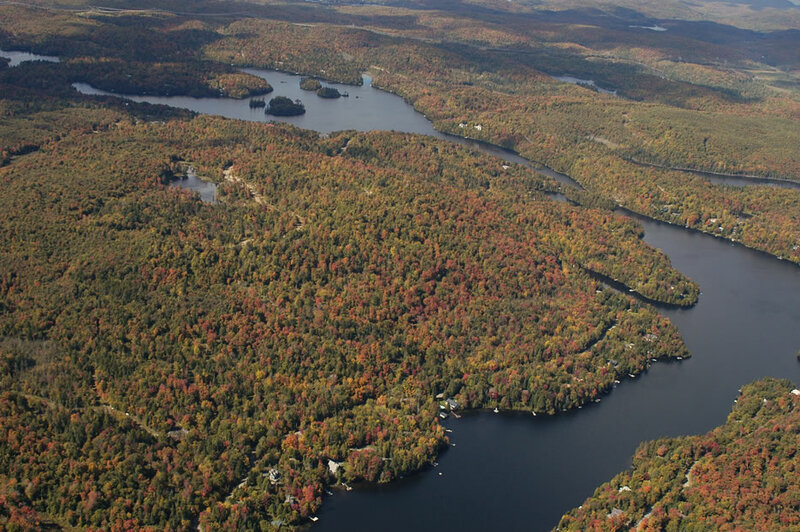 Only 6 lots are left for sale on lake St-Cyr. For details please consult the site plan. 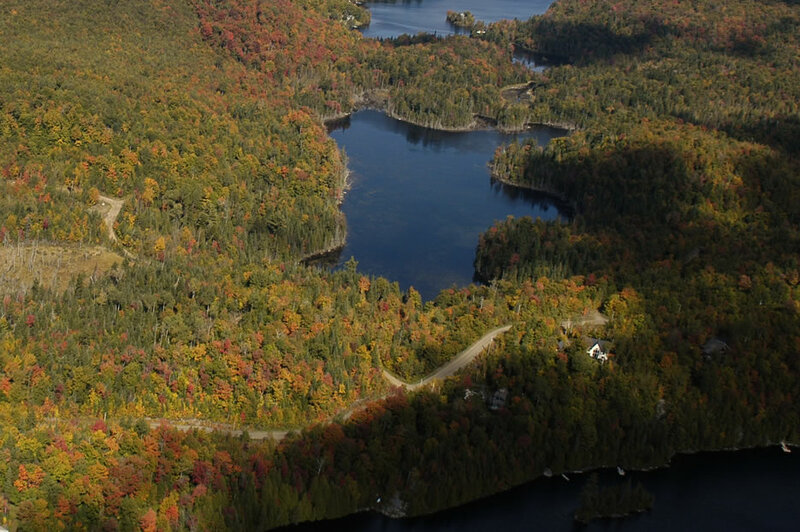 The St-Victor summits are located south of lake St-Victor and are about 200 acres (80 hectares).This magnificent site offers private and peaceful estates all located on leveled mountain tops for easy constructions, ideal for a pool and tennis court. 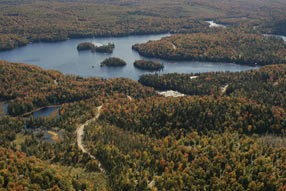 They are seperated by private trails that join up with Lake St-Victor’s extensive trail network. All the estates have a private access to water and have a dock at their disposition. 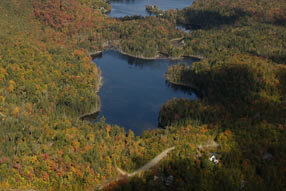 The breath taking views look down over the wooded valleys and the blue water of the lakes below. The sector is divided between the north summits that are 13 lots and the south summits with approx. 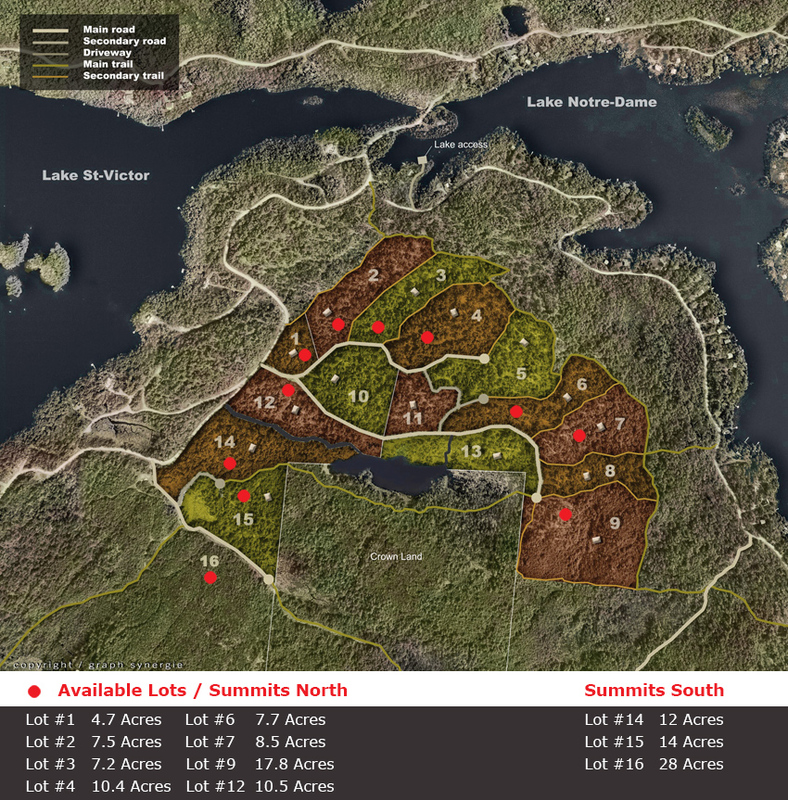 8 lots to be defined, all of 5 to 10 acres (2 to 4 hectares). It is the beginning of this phase, so the first buyers will have the best choice. A nice view is beautiful all year round. For more details please consult the http://www.sommetstvictor.com/. 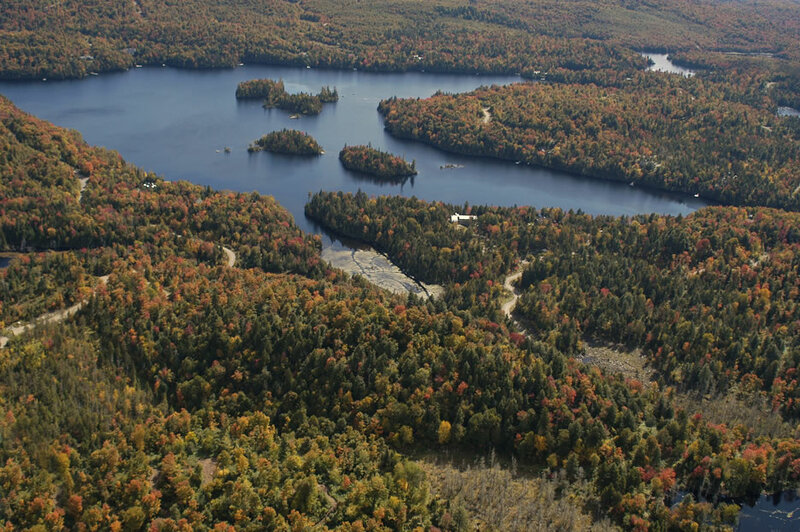 This site is north-west of lake St-Victor, Buck Mountain has magnificent mountain properties with spectacular views on about 100 acres (40 hectares). Each estate is divided following the topography so that the land has a level portion easy to build on and ideal for a pool or tennis court, etc. 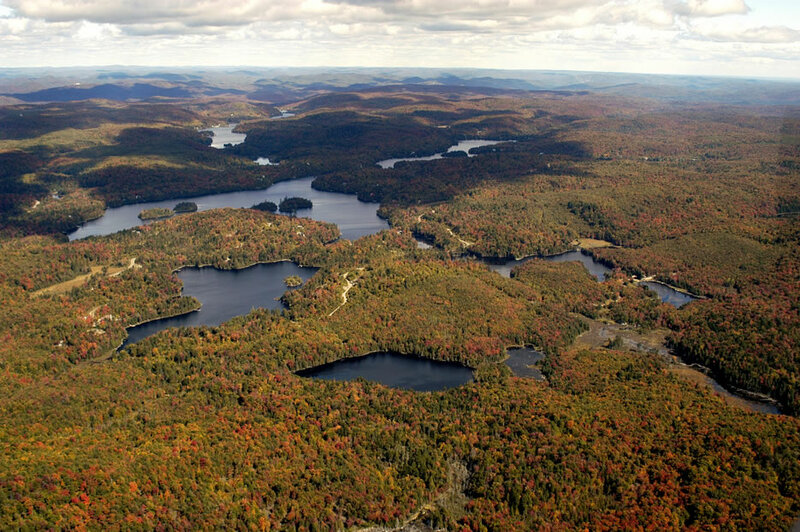 Next to Buck Mountain is lake Rozier preserved on Crown Land with easy access and completely natural. This phase will only have twelve lots of 5 to 10 acres (2 to 4 hectares) to be finalized upon demand. 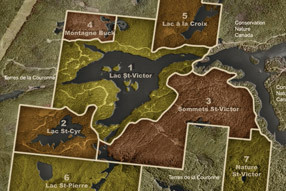 Lake à la Croix is situated north-east of lake St-Victor on 300 acres (120 hectares). 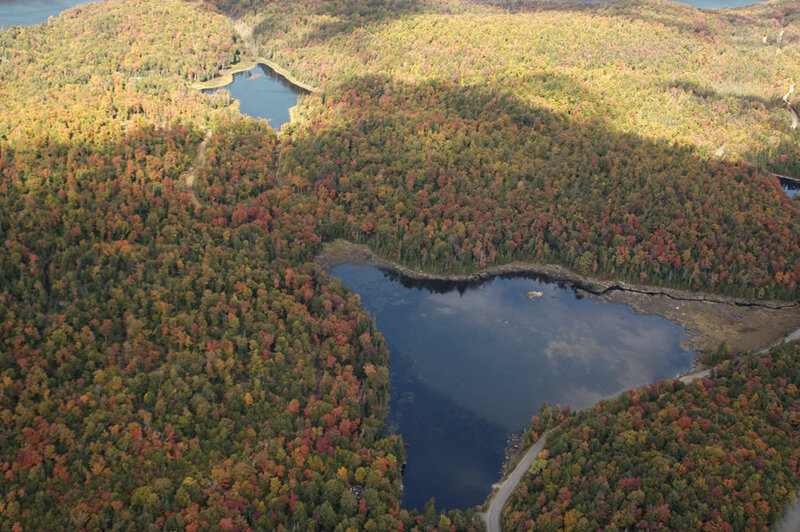 This smaller lake offers its buyers a natural environment. It will eventually be divided in 8 big lots of 183 lin.m. (600 lin.feet)of shoreline by the lake and 8 or more (to be determined) in the mountains with nice views and a private access to the water. 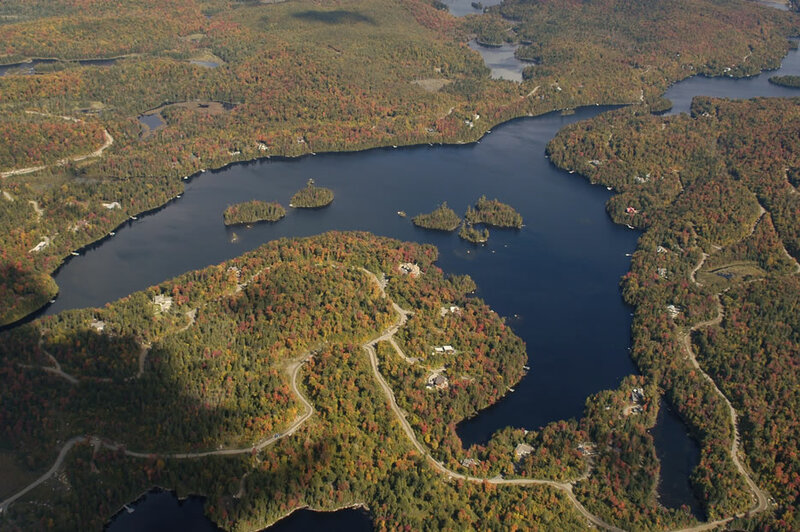 Residents of lake à la Croix will have a privileged access to the famous aerobic corridor that is easely reached by the Lake St-Victor Estate’s trails on the property. 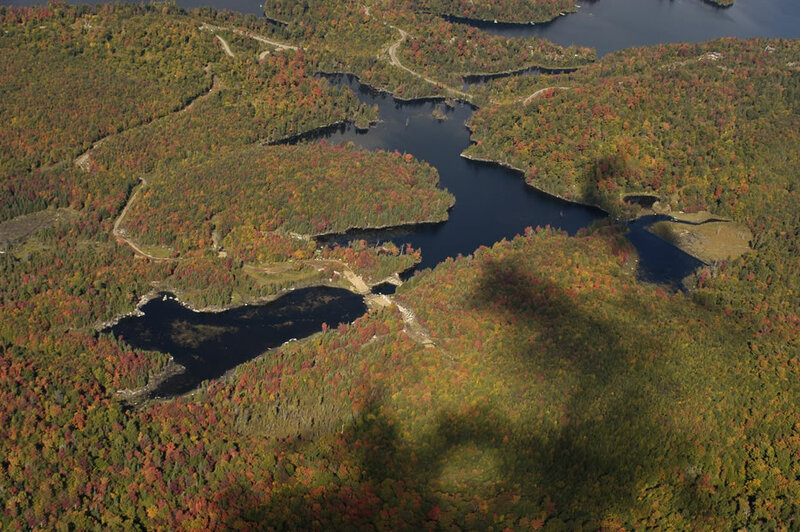 This lake is tributary of lake St-Victor and St-Cyr, and is situated south-west of the project on 140 acres (64 hectares) of land. Once again big lots are available. There are 10 lots. This phase is south-east of the territory. 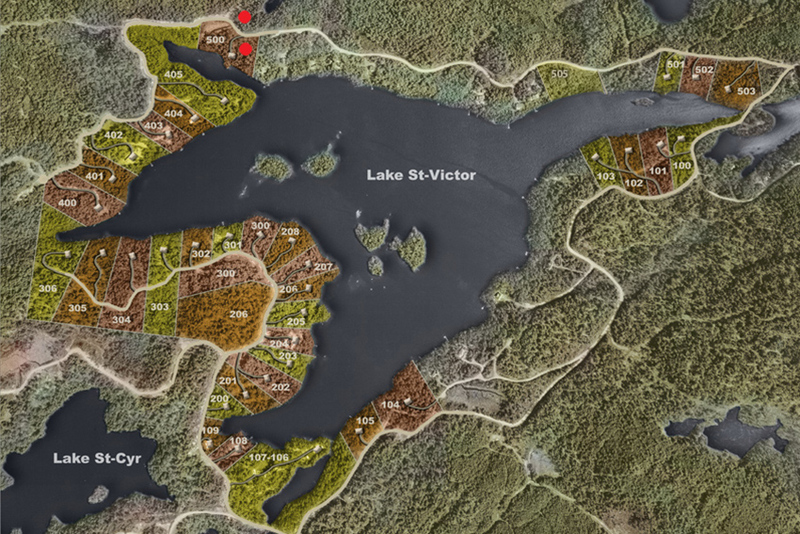 It is the most isolated part of the Lake St-Victor Estates. For this reason ¨Nature¨ means wild and green. It is planned to build self-sufficient affordable small wood houses on lots of 5 acres (2 hectares) and more offering to its clients a natural and unique setting. 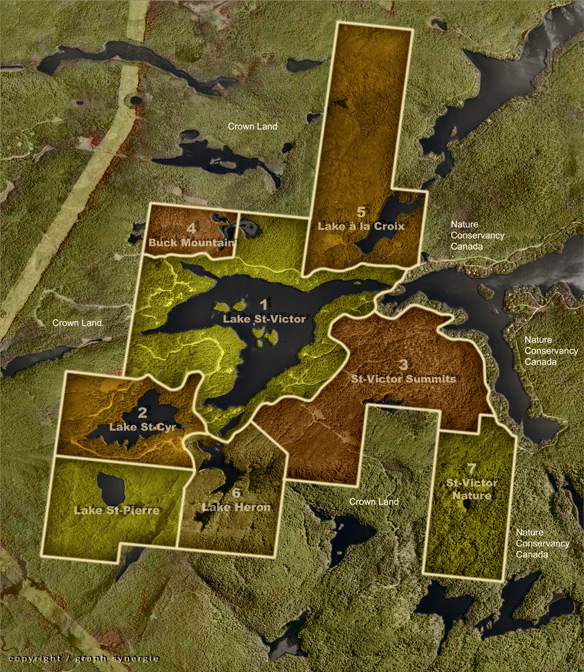 This territory is completly surrounded by ¨Nature Conservancy of Canada¨ and ¨Crown Land¨. 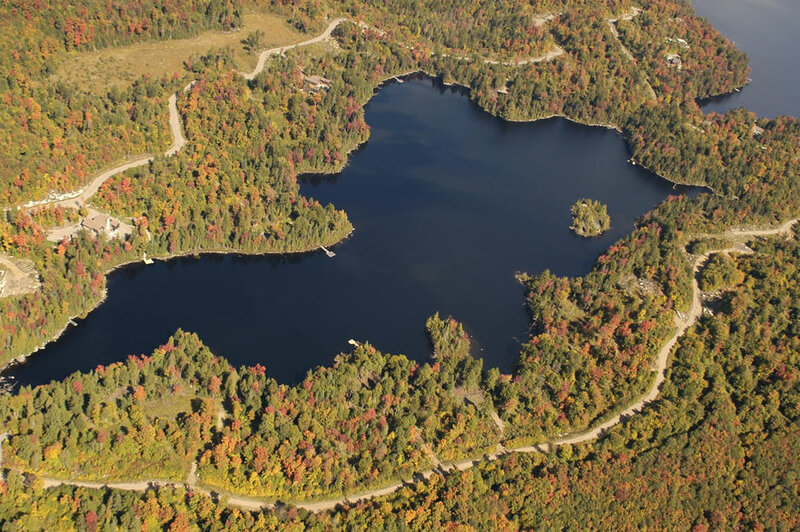 There is a small lake in the center of the property and 3 other lakes completly wild on the ¨Crown Land¨within walking distance. It is truly a nature park easy to reach. This futur phase is presently offered for a global sale, either for a developper or a unique private estate. 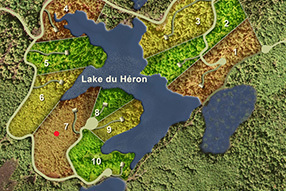 Lake Thurson and Wheeler, owned by Lake St-Victor Estates are located far East of lake St-Victor and are not part of the overall plan of the Estates. This territory is approx. 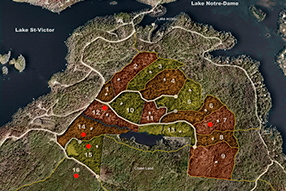 375 acres (150 hectares). Small affordable lots of 2 to 5 acres (0.8 to 2 hectares) are presently available. 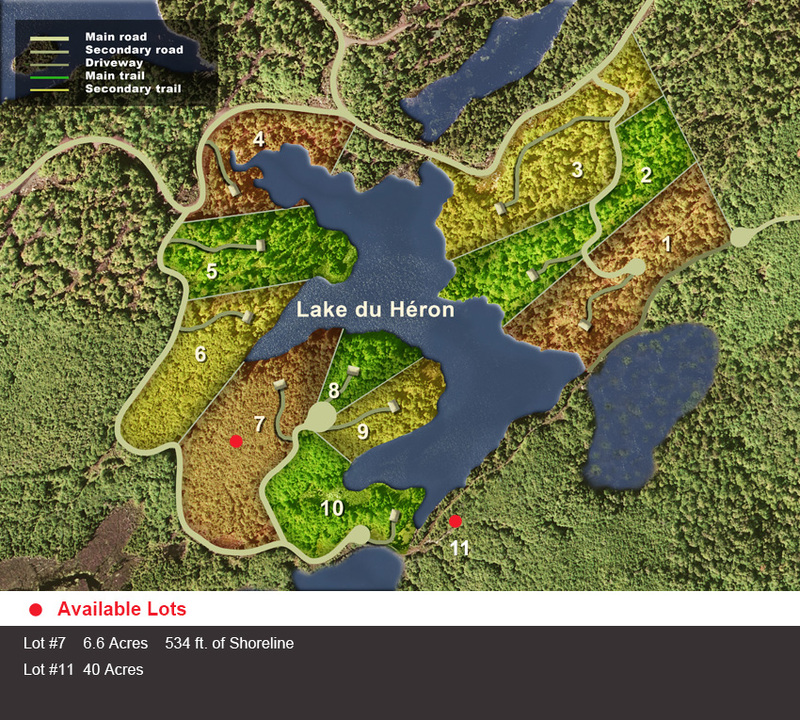 These lots have easy access on a main road and are only 5 minutes from Morin Heights and 12 minutes from St-Sauveur. This territory is also available for a global sale or in part, ideal for a developper or a private estate. 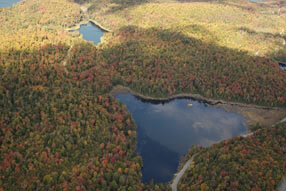 Their are two large parcels of 300 acres (120 hectares) and 75 acres (30 hectares) seperated by Montfortain road.